While putting Loo Loo to bed the other night Pinky came into the room and asked, “Can I hold sister please? I want to sing her a lullaby.” I said sure honey but you have to sit down in the chair nicely. So she did, and sang Twinkle, Twinkle Little Star to her, or her version of it. She says, “Twinkle, Twinkle Star, How I see are”. 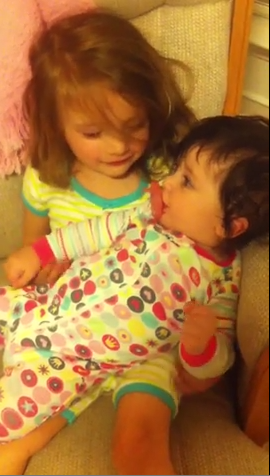 It’s the moments like this that make the chaos of having two little ones all worthwhile. My days can be crazy but at the end of the day it’s family that matters and my two girls make all that craziness worth it. Doesn’t it just melt your heart? What’s a family memory you have that just melts your heart? Super cute! thanks so much for sharing! Those are the moments that make it all worth it! Your little ones are precious! That is so sweet. I have so many memories of my children, it is so hard to put just one. My daughter who is 4.5 yrs younger then my son ” he has Autism” smooth his hair back when he would get up set and say “Devy it will be ok” his name is Devon… it always touched my heart and brought me to tears many times.. They are great at that age. I wish I could go back to that age. I loved it! They are so cute. they certainly are, it’s so sweet to watch them! Watching my two grandsons interact melts my heart. They sit together on the sofa and my older one feeds my younger one little cereal bites and he tells him “Just one at a time…”. Aww, that is too sweet Janet! What a joy they must be! That is just adorable. Even though they drive you absolutely nuts some days, children are a wonderful blessing. I have 3 at home and one with wings. I love when they sing in their own way and just dance to music without caring how they look. Such innocence when they are young.